Jovanni Sy is a playwright, director, actor and since May 2012 the artistic director of Gateway Theatre in Richmond, BC. Sy, who has Chinese-Filipino ancestry, was born in Manila and raised in Toronto. 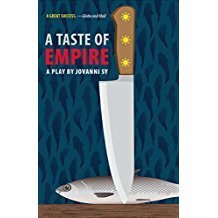 When his play A Taste of Empire premiered in 2010, it was nominated for two Dora Mavor Moore awards including outstanding new play. 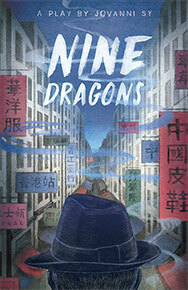 Set in 1920s Hong Kong, Nine Dragons is a hard-boiled detective fiction with a twist: an inquisition into colonialism, racism, assimilation, and the clash of cultures. It’s the classic mystery/detective genre overlaid with the topical issue of identity – a struggle that any person of colour faces in any society that privileges whiteness. The premise of the show is a once-in-a-lifetime cooking demonstration by Chef Maximo Cortés, the renowned inventor of his signature-style “Imperial Cuisine.” The audience excitedly awaits Chef Maximo’s arrival, relaxing with cocktails and complimentary hors d’oeuvres served to their seats. Suddenly their complacency is broken when Maximo’s amusing assistant, Jovanni, appears onstage. The celebrity chef in unavailable, but no worries: Jovanni, too, is an expert at preparing the traditional Filipino dish Rellenong Bangus (Stuffed Milkfish), and the audience follows along on a journey filled with humorous banter and a silky milkfish, sharp chef’s knife in Jovanni’s hand. As he cooks, he deconstructs the dish in humourous and surprising ways, serving up opinions on the European colonization of Asia, the state of modern agriculture, the ethics of food distribution and consumption – only a few of the ideas sampled in this engaging performance piece. When the actual fish dish is cooked and ready to eat, audience members are given tasting plates and even more food for thought. A Taste of Empire is truly a feast for the mind and palate. We call it “Iron Chef meets Guns, Germs, and Steel.” Bon appetit!